Eric Bloodaxe, King of Northumbria. 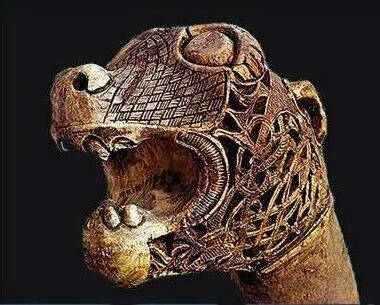 Eric Bloodaxe, probably one of the best-known names in Viking history, was known in Old Norse as Eiríkr blóðøx, and reigned for a short time as King of Norway and twice as King of Northumbria (c. 947-948 and 952-954). Eric, a colourful figure, was the son of the Norwegian King Harald Fairhair, the first King of Norway and Ragnhildr in ríka, daughter of Eric of Jutland. The Icelandic sagas relate that began his career of piracy at the age of 12. He married Gunnhild, the daughter of Gorm inn Gamli ('the Old'), the king of Denmark. According to the sagas, Eric became king of Norway after the death of his father and had four elder brothers slain in attempt to retain the crown. He was finally ousted by his younger brother Haakon the Good and sailed to England where he made himself king of Northumbria and lived at a palace in York (Jorvik). Archbishop Wulfstan of York reneged on his pledge to Edred of England and hastened to offer his alliegience to Eric. Northumbria had previously been bitterly fought over between the Saxon kings and the Hiberno-Norse line of descendants from Ímair, kings of Dublin. The Norse Sagas state that he periodically raided in Scotland and around the Irish Sea. The sagas paint Eric Bloodaxe as a barbarian, a murderous tyrant whose savagery was shocking even by Viking standards. The Anglo-Saxon Chronicle is less vivid on Eric, and records the Northumbrians selecting Eric Bloodaxe as their king in 947. The Anglo-Saxon King Edred responded by invading and ravaging Northumbria, burning down St Wilfrid's minster at Ripon. As Edred's army returned south, Eric's Viking army caught up with its rearguard and 'made a great slaughter' at Castleford. In retaliation, the enraged Edred threatened to destroy Northumbria, the Northumbrians, fearful of his wrath, abandoned Eric and made reparations to Edred. The fountainhead of disaffection in the north appears to have been the wily Archbishop Wulfstan of York, Edred captured the troublesome Archbishop in 952 and imprisoned him at his castle of Judanburh. The Northumbrians later accepted Olaf Sihtricsson, a Viking from Dublin, as their ruler, to which Eric responded furiously and took over Northumbria for a second time. Finally in 954 Eric Bloodaxe was expelled for the second and final time and King Edred of Wessex and England gained control. From then on York and Northumbria remained part of a united Anglo-Saxon kingdom. Eric Bloodaxe was killed in an ambush at the age of 59, along with five kings from the Hebrides and the two earls of Orkney, on the bleak moors of Stainmore in Teesdale by Maccus, an agent of Oswulf Ealdulfing, the High Reeve or Earl of Bamburgh, who ruled Northumbria north of the Tees. Oswulf was a supporter of Edred, who may have encouraged the murder. Roger of Wendover relates that Eric, together with his brother, Ragnald and son, Haeric, were treacherously killed by one Maccus "in a lonely spot called Steinmore (Stainmore)". Symeon of Durham notes that Eric was "driven out and slain by Maccus, son of Onlaf". It seems likely, therefore, that Maccus was the son of either Olaf Guthfrithson or Olaf Sihtricson. Although Maccus was the instrument of Eric's death, Roger of Wendover makes it clear that he was betrayed by Earl Oswulf. For at least six years, Oswulf (in a charter of 949, he is called "High-reeve at Bamburgh") had been ruling English territory north of the Tees. Now, by Edred's gift, he became Earl of Northumbria. A long-held local legend states the Rey Cross at Stainmore was the burial place of Eric Bloodaxe, however it is argued that it was merely a boundary stone, halfway between Penrith and Barnard Castle. In 1989, an excavation was carried out but no bones were found at the site, although it remains possible that Eric's burial might be elsewhere on the Stainmore moors. As a prince were coming.